*Thank you all so much for your wonderful and kind comments, prayers, thoughts and sentiments on my last post about Mally. Our hearts are broken, but the love and support we've received from family and friends has made it a bit easier on us. Thank you. 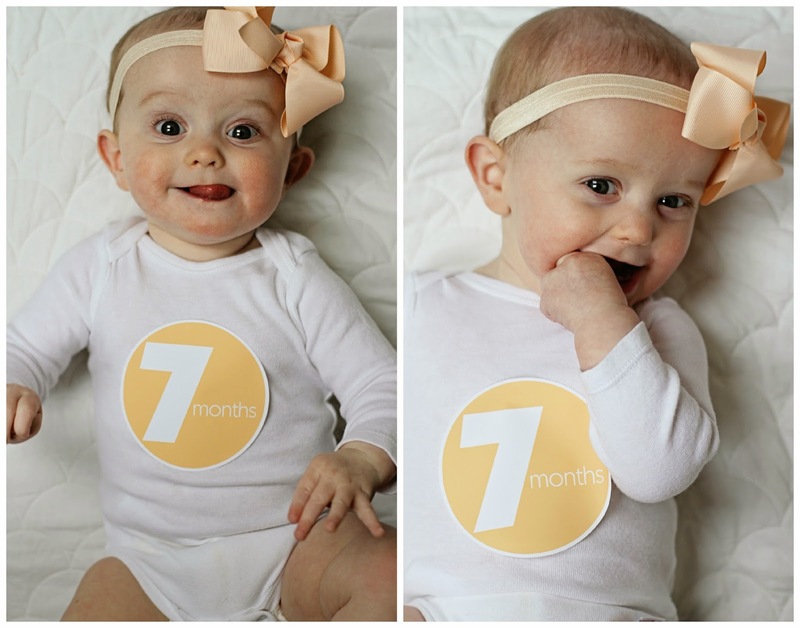 You are now seven months old. 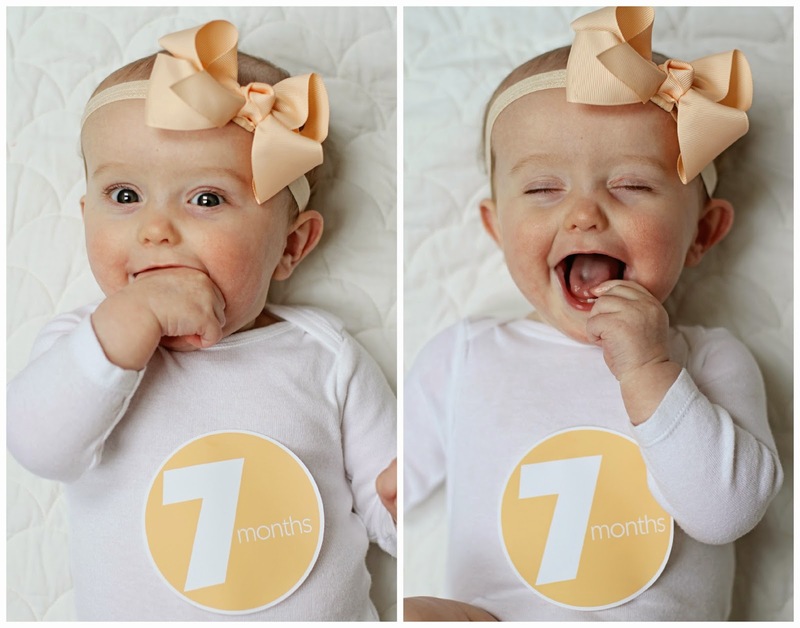 SEVEN MONTHS. Where is the time going?! I'm completely baffled by how it's even possible that over half a year has gone by since you were born. Wasn't I just pregnant? 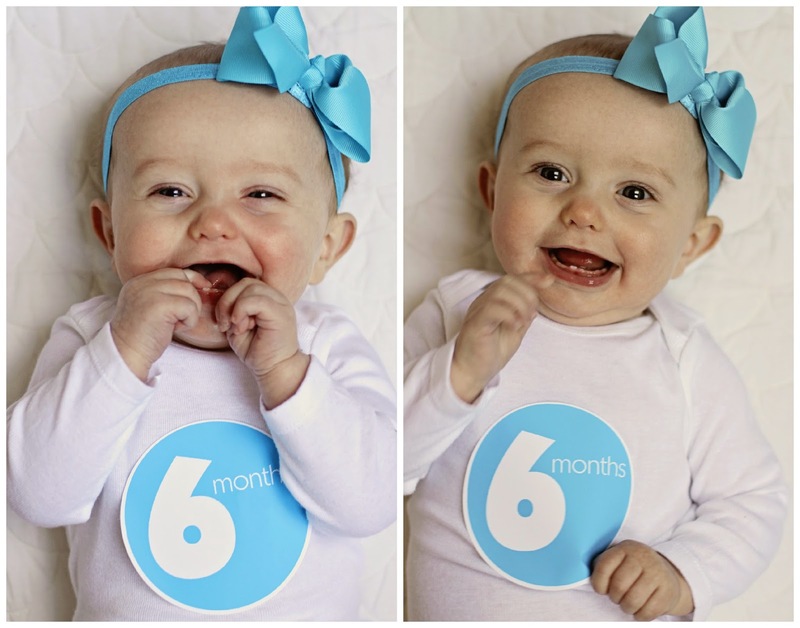 I feel like weeks fly by quicker than I can register, as evidenced by the fact that I didn't even get your SIX month post finished and here it is nearly two weeks into your seventh month. So, I'm just going to throw this post together in the hopes that I can adequately cover what's been going on with you before eight months sneaks up on me. Oh, where do I even begin? I think it's pretty safe to say that over the last two months, you've really matured. All of a sudden you have opinions and love to express them! Particularly about who is holding you. If you want someone other than the person who's arms you're currently in, you make it known to the entire neighborhood. My quiet easy-going baby demands to be heard! You also express yourself very loudly when it comes to getting other things you want, like your bottle, food and toys. I thought Mac was going to be the loud one in the house, but you're giving him a run for his money (or maybe you are just learning from the best). Your physical appearance is also quickly changing. 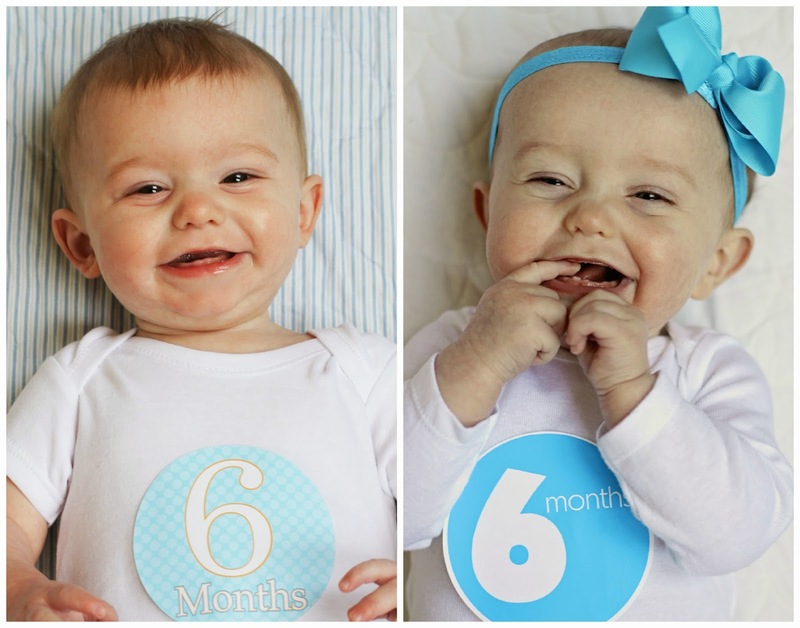 At your 6 month well-visit you were 18 pounds (75th percentile) and nearly 28 inches long (95th percentile). You are packing on the thigh rolls and getting cuter by the day. You are bigger and longer than your brother was at this age. You're in 9 month clothing and size 3 diapers. You are finally getting some hair, but mostly fuzzy stuff on the sides. It looks light brown or reddish blonde, depending on the light. You still feel like a peanut compared to Mac now, but I'm amazed at how long you look in the mirror when I'm holding you and how strong you are these days. About a week before you turned 6 months you got your first tooth - your bottom front right tooth. You hadn't slept well for weeks before it happened, so we were thrilled once it finally broke through. Less than a week later, you had the other bottom front tooth and since then you've been happy as a clam and sleeping MUCH better. And speaking of sleep, you're doing really great (knock on wood). You usually go to bed around 6:30 p.m. and sleep until about 6:00 a.m. with one wake-up/feed at 11:00 p.m. That's not too shabby kiddo. We'd love it if you would stay up an hour later and sleep an hour later, but we're not complaining too much, since we know it could be much worse. I'm hoping to keep you on the exact same schedule with no adjustment for daylight savings next weekend, in the hopes that it will work out for us. Fingers crossed. Occasionally you'll wake up in the middle of the night and want to play (or cry), but you can usually put yourself right back to sleep without our help. We've been trying to not go in your room to give you some time to work on your self-soothing, something that we never did with your brother (to our own detriment). And sometimes in the morning you get up WAY earlier than we're ready and we'll give you a paci and turn on the little fish tank toy in your crib and you will chill out for a while just watching that. It's great. Napping is another story. You seem to nap fine for the nanny during the week (2 naps, 1-2 hours each), but you refuse to nap much longer than 20 minutes on weekends or when your dad and I are home. I think it's because you miss us and don't want to miss out on anything. By Monday you are always ready for us to go back to work so you can catch up on your daytime snoozing. 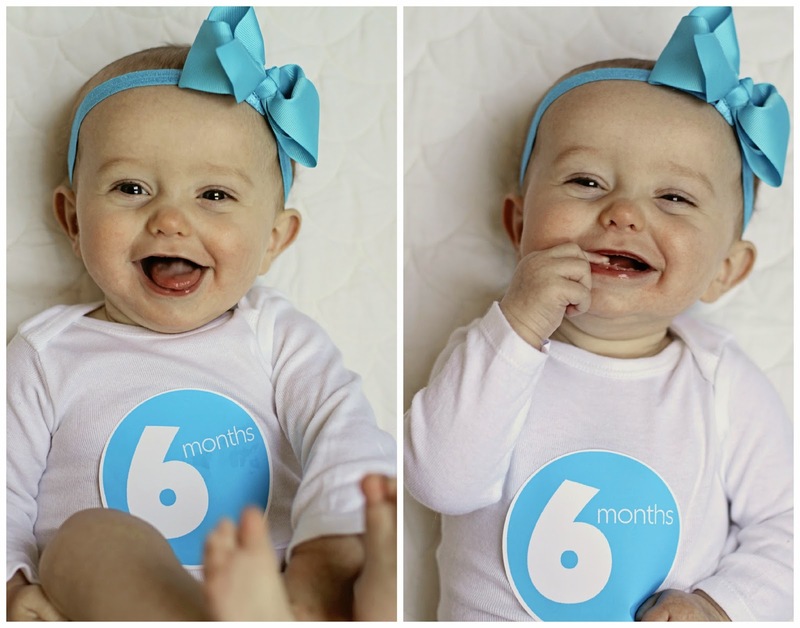 You also started eating solids at 6 months. We are doing Baby Led Weaning again and it's going much slower this time around. You do not have the voracious appetite for any/every thing like your brother did. You try things here and there, but until very recently, you haven't really been very interested. I'm struggling with remember what to feed you and extra paranoid this time around about gagging/choking (thanks infant CPR class), so we've been going slow. So far you've tried pears, apples, plums, nectarines, bananas, bagels, carrots, celery, cucumbers, mango and bread. And by "tried" I mean, you've gummed them and then threw them on the floor. We're getting there. We are just now finishing up our frozen breastmilk supply and have started you on formula. You don't seem to really mind it much, which is good. You usually take 4-5 bottles at day (6-8 oz each), with one middle of the night bottle (8 oz). 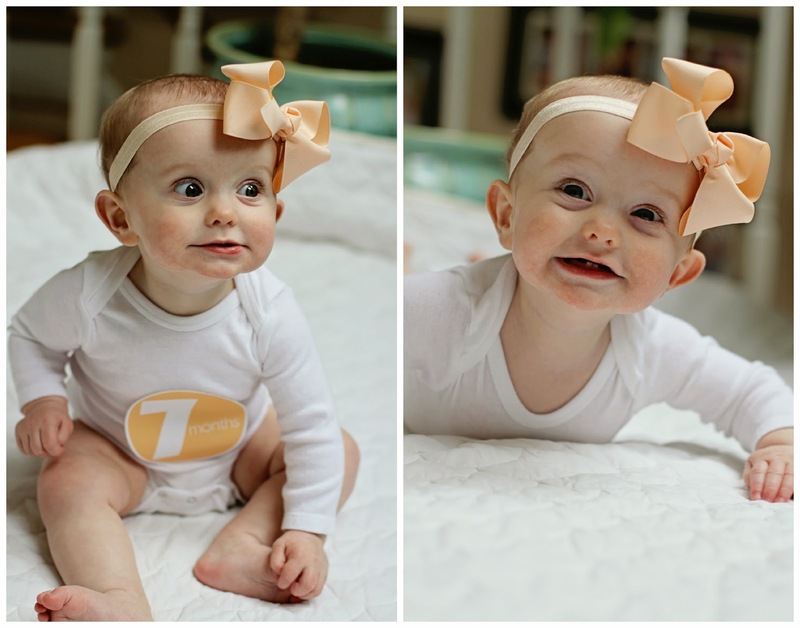 At seven months, you are just now sitting up (tripod) by yourself for any length of time. You sometimes get distracted and fall over, but for the most part, you seem to get it. You can push up completely when you're on your belly, but you've shown no signs of trying to crawl. You really don't want to sit or lie down at all, you insist on standing and bouncing. I sometimes wonder if you're going to skip crawling completely and just go straight to walking. I wouldn't be surprised. Your brother was crawling and pulling up by 7 months (over-achieving first child), which you're not ready for at all. I'm not sure if that's just because you have no interest in that or because you'd much rather be held (or you're held by default as we're chasing Mac around the house all the time). Who knows. But I'm certainly not in any hurry for you to be mobile. I love carrying you around and I'm not ready to have 2 of you on the loose in the house. If you want to wait until you're 2 years old to crawl or walk, that'd be fine with me! As I mentioned earlier, you have certainly found your voice these days and love to express yourself. You scream at the top of your lungs when you're not getting what you want or if we're not paying adequate attention to you (not a scream/cry, more like you just yell at us...very loudly). No sign of words yet, but you do babble a lot, mostly "nanananana." You also love to growl, which is hilarious. You have this deep weird growling noise that you make all the time. We call you our little lion. You and I go back and forth growling at each other and then laughing about it. You love to laugh, too! You might just have the greatest laugh ever. I tickle you all the time and play peek-a-boo with you to get laughs, but no one can make you laugh like your brother. He doesn't even have to do anything funny and you crack up. You absolutely worship him and love any attention that he gives you, even if it's negative. But you also crack up and think it's hilarious when he cries, which I find adorable. The louder he is, the funnier you think it is, and the madder he gets about it. Oh, siblings are the best. Your personality continues to shine and I love getting to know you more as the months go by. You are so happy! You wake up happy, you go to bed happy, you're almost always happy! You're also so sweet and snuggly - you love to be held and cuddle. You are much better at independent play than Mac ever was (or still is), but you also love being part of the action and let it be known when you're being left out. You love watching TV, which is foreign to me, since Mac has never really been into watching for more than a minute or two. Of course we don't really let you watch TV, but if it's on in the room, you're paying attention. You are also very into music. Your daddy loves to play music for you, sing to you and play the guitar for you -- you eat it up. Music is one of the only things that will calm you down when you get really upset (overtired). Bath time is your absolute favorite time of day. No matter how tired or cranky you are, when I turn the water on and get you ready for bath, you nearly lose your mind. You kick and splash and have the best time. Oh Mim (or "Mimmy," as Mac calls you)...you're just about the greatest thing ever. We are so happy to have you in our family. You complete us! Thank you for being such a lovely wonderful baby. And thank you for being mine. You have the 2 most cutest, happiest kids!! I love it!! 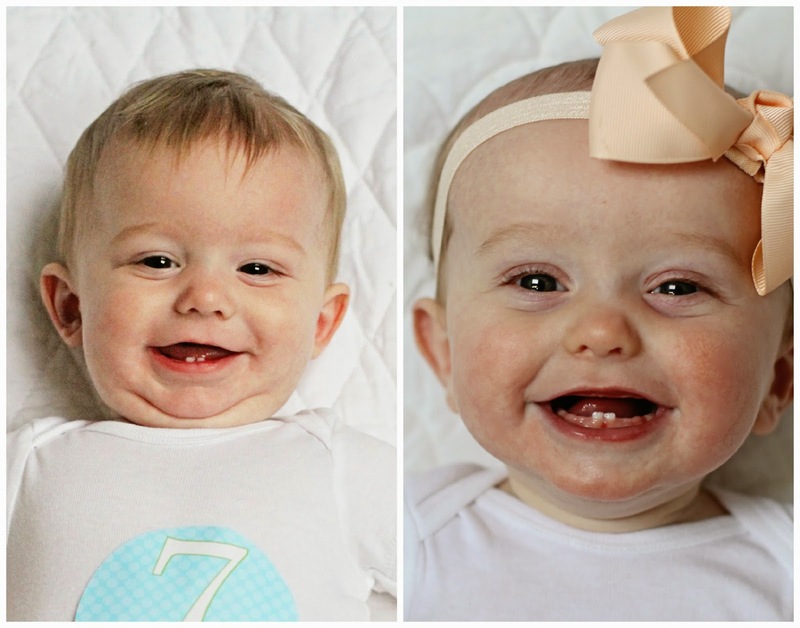 Makes this rainy Thursday morning much easier after seeing those sweet smiles! My goodness, she's such a doll! She's just the sweetest. The growling! Love it. You're baby posts always give me baby fever. Gosh, she is absolutely GORGEOUS! I love her expressions, huge smile, expressive eyes. That little smile, and those teeth!! So darling!! Gah! I could just eat her up (please don't think I'm weird by saying that)! I'm so jealous of what a great sleeper Mim is. 6:30p-6a?! You are so lucky. Isn't sibling love the best? I just know Mac is going to be that protective big brother one day! Wow she's so cute and happy! I love the color coordinating bows and stickers! I remember loving this age... They were still babies but started having such a personality! The expressions this girly has are amazing! Lol! Her & Mac are definitely siblings. 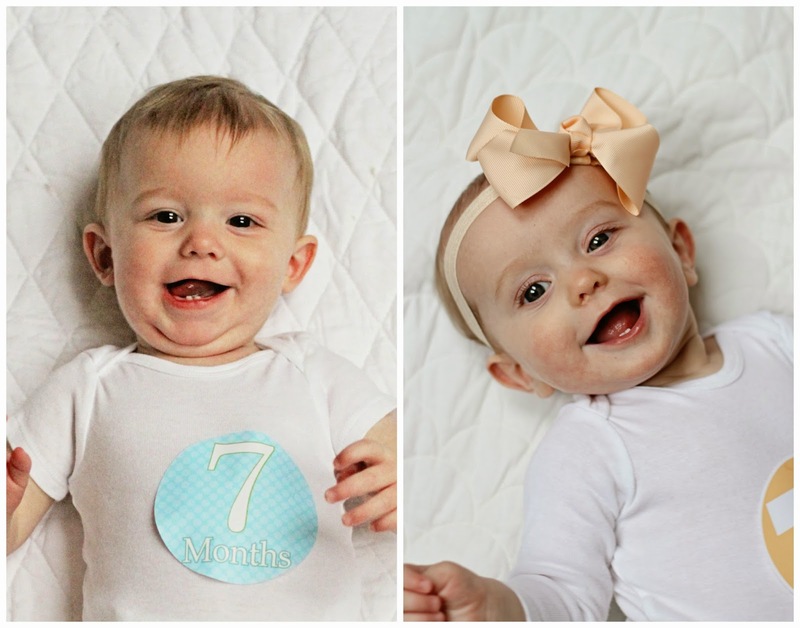 Love the side by side pics of the 2 kiddos! they are SO siblings! And Mim is so expressive. Yay for all that awesome sleeping she's doing at night! I mean it would be even better if she napped for you guys too but at least she's a champ night sleeper!!! She's so cute! I love the 7mo bow -- that's just an awesome color! 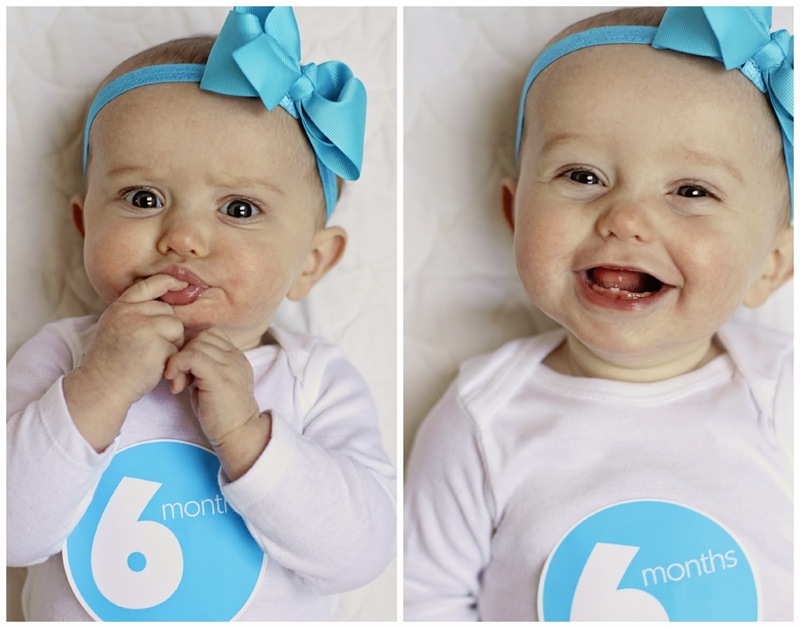 Oh and that phot on the top with her hand in her mouth for mo 7 -- she looks like baby mac with a bow on her head! Oh she is TOO CUTE! Our daughter is 10 months old and I still feel like she should be 4 months old or something. Time flies! She seriously has just the sweetest smile! And I love how much her & Mac look alike, yet each has their own distinct look as well. OMG I just want to squeeze her! She is the cutest, happiest little thing! So adorable!! I always want to reach through the screen & squeeze her! 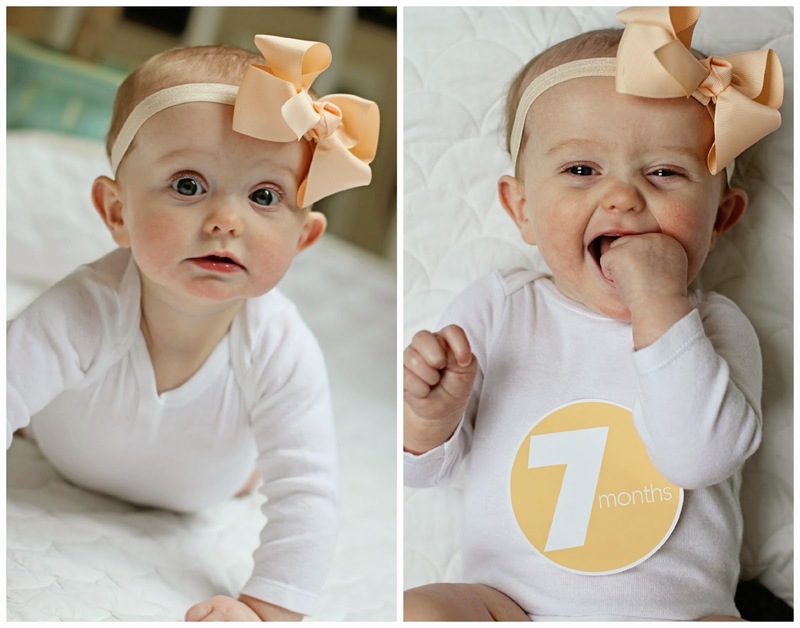 It's official - that girl is a baby model! Her smile is so adorable! Oh my goodness I never realize how similar she and Mac looked!!! 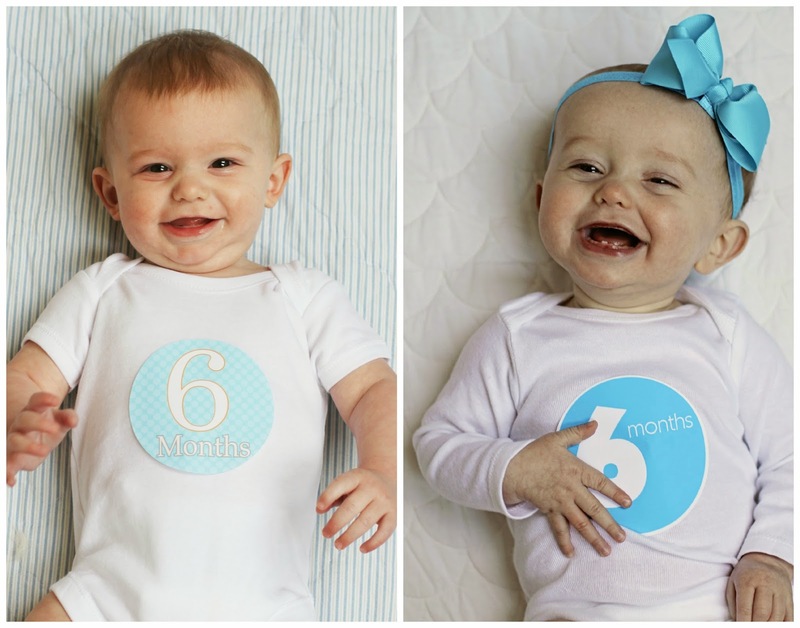 You have the happiest, cutest, and sweetest babes!!!! Love love love her sweet little face. Maybe she can come teach Theo a thing or two about sleeping 12 hours at night!! Their little noses are just too cute! SO similar, but yet she's so girly! Give her about a month on the eating and she will be scarfing down food, I bet. That sweet little face. That SMILE! Those two front teeth. My gosh. I am in love with her! She must be such a light in your lives and I don't think I could ever have a frown on my face around her. 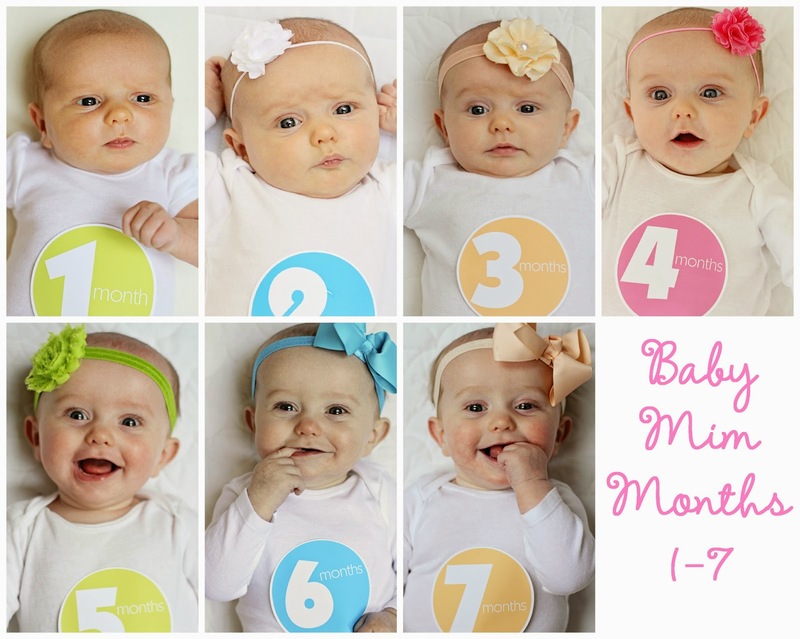 Happy 7 months Mim! What a beauty. Same here on weekend naps, I agree that it's because they miss us! Love the hair bows too! Adorable!! I can't believe those teeth!! I definitely see more of her brother in a few of those pictures. 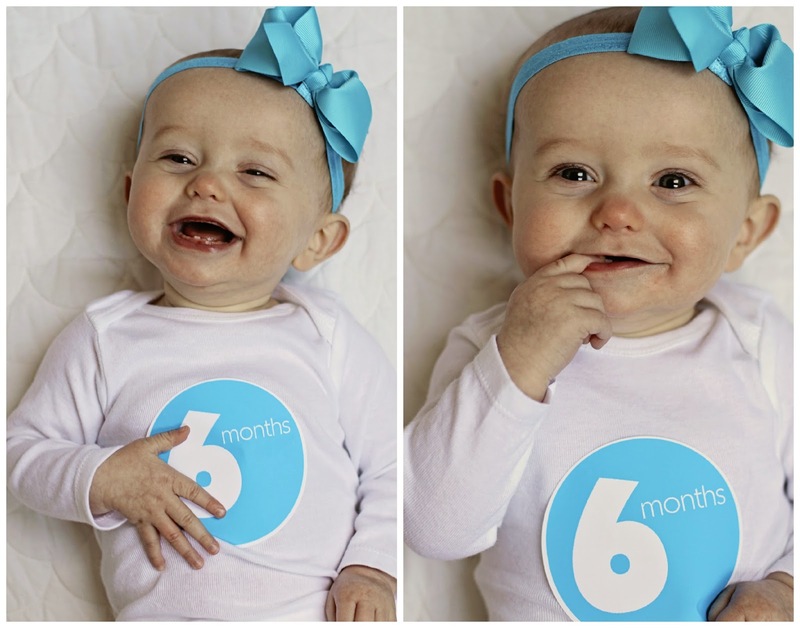 She seems like just the sweetest little thing, I always can't help but smile when her smiley face pops up on blog/IG. :) What a fun age!! Wow I am really seeing resemblances to her brother now..more and more as she gets older. And I totally feel you on the not pushing her to walk/crawl til she's two...it's so funny how you rush the first one into moving and then you realize just how nice it is to have the second one still!